Singapore Transport Information at a glance! 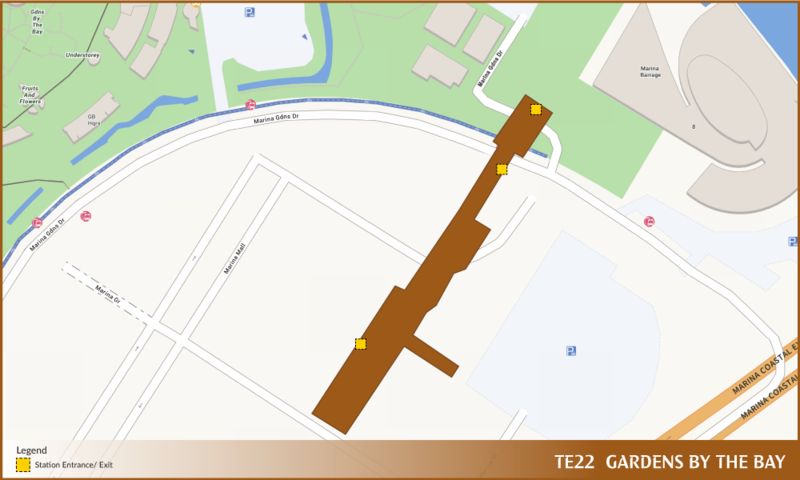 Gardens by the Bay MRT Station (TE22) is an underground station located along the Thomson-East Coast Line (TEL) Stage 3. It is built just off Marina Gardens Drive, bringing rail connectivity to both Gardens by the Bay (Bay South), Marina Barrage, and future developments in the Marina South area. The areas around the station are planned to be developed into a mixed-use, high-density commercial and residential district that provides more options for city living. The station is targeted for completion and opening in Year 2021. It will serve as the terminus of the Thomson-East Coast Line until Stage 4 of the line opens in Year 2023, when the line will be extended via Tanjong Rhu to Bayshore. Gardens by the Bay station has two platforms in an island platform arrangement. Full-height Platform screen doors isolate the air-conditioned station from the tunnel environment, enhancing commuter safety and station comfort. A set of escalators, stairs and lifts connect to the concourse above. Passenger Information Systems, which are plasma display screens located at each platform, display expected train arrival times and key messages. Tactile flooring helps to guide the visually-handicapped from the platform to the station exits. As the terminus of the Thomson-East Coast Line (Stage 3), both platforms are utilized alternatively for train turnarounds. When Thomson-East Coast Line (Stage 4) is opened in 2023, trains heading East from Gardens by the Bay station towards Bayshore will pass through TE22A Founders’ Memorial station which is scheduled for opening in 2025. The concourse features faregates for automatic fare collection and provides access between paid and unpaid areas of the station, with at least one bidirectional wide-swinging gate for the benefit of passengers-in-wheelchairs and those carrying bulky items or travelling with prams. General Ticketing Machines allow commuters to purchase tickets for single or multiple journeys, and along with Top-up Machines, offer contactless card transactions. The station office functions as a Passenger Service Centre, and is staffed during operating hours, where commuters may make travel inquiries or perform card transactions using cash payment. A public toilet is located in the unpaid area of the station concourse. Gardens by the Bay station is one of six stations along the Thomson-East Coast Line (Thomson stretch) designated as Civil Defence (CD) shelters, which will be activated in times of national emergency. Apart from reinforced construction, the stations are designed and equipped with facilities to ensure the shelter environment is tolerable for all shelterees during shelter occupation. These facilities include protective blast doors, decontamination facilities, ventilation systems, power and water supply systems and a dry toilet system. The other CD shelters are Woodlands, Lentor, Mayflower, Bright Hill and Mount Pleasant stations. Gardens by the Bay MRT station will likely have three exits leading to ground level. More details will be confirmed closer to the opening of the station. It will also connect with the basements of nearby developments. Emergency Train Stop buttons on the station platform, when activated, will prevent approaching trains from entering the station, and any train already stopped at the platform will be prevented from moving off. Emergency telephones at station platforms and the intercom system inside the lifts enable commuters to communicate with station staff in the Passenger Service Centre. Emergency door handles allow the platform doors to be opened manually from the train-side in the event of failure. Contract T228 for the Construction of Gardens By The Bay Station and Tunnels for Thomson Line was awarded to Nishimatsu Construction Co., Ltd – Bachy Soletanche Singapore Pte Ltd Joint Venture (JV) at a contract sum of S331.0 million in July 2014. Copyright © 2019 Land Transport Guru. All rights reserved.